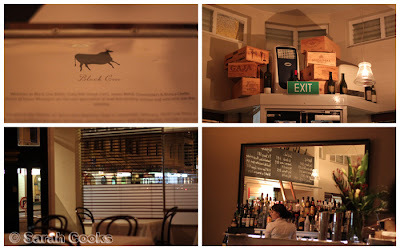 A mere 5 minutes from our hotel, (although I soon came to realise that nothing in Launceston is very far at all), the Black Cow Bistro is a chic steakhouse located in a historic building that was once a butcher. 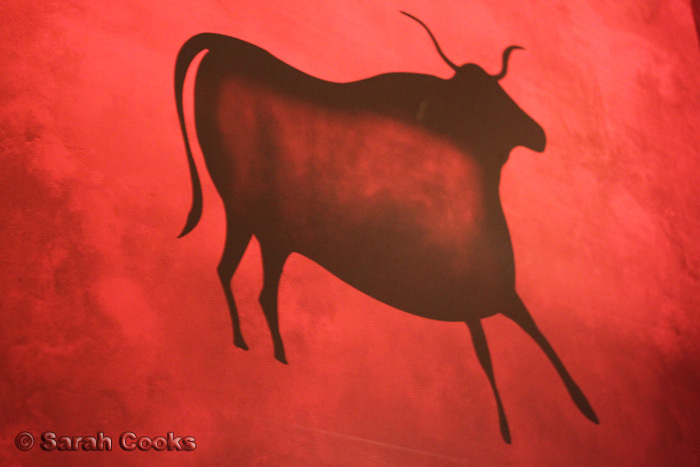 The dim lights, red paintings and simple decorations create an atmosphere that is warm and welcoming. It was just what we needed after such a hectic day: work, flying to Launceston, figuring out how a Ford Falcon works, navigating our way through the Launceston streets to the hotel, dumping our stuff and - finally! - sitting down to dinner. Aaah. 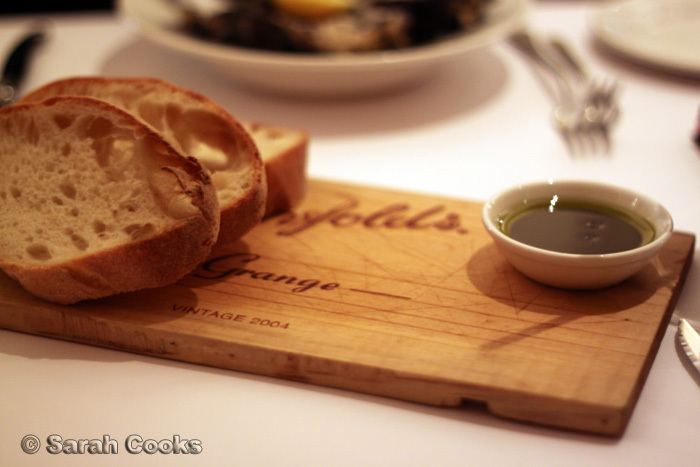 After we ordered, we were asked if we wanted some bread, which came with a lovely lemon-infused olive oil and balsamic vinegar. It was warm and crunchy, and I loved the cute presentation! 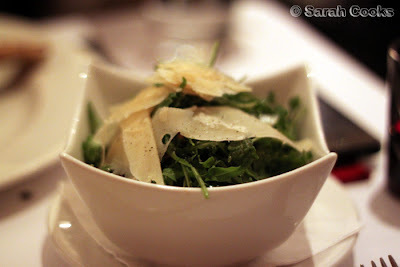 But I must say I was a bit miffed when I saw the $4.80 charge on our bill, as there was no mention of bread anywhere on the menu, and we weren't told it was an extra. Bread not included? I think that's a 'sin' for which Stephen Downes would automatically deduct 2 points. I'm not that harsh, but I would have liked to have been told about the extra charge first. But, onto more positive things. 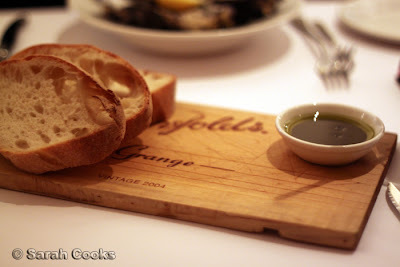 The menu clearly states the provenance of each of the items, and apart from my interest as a food-loving tourist, it was so nice to see the obvious pride that the owners have in Tasmanian produce. 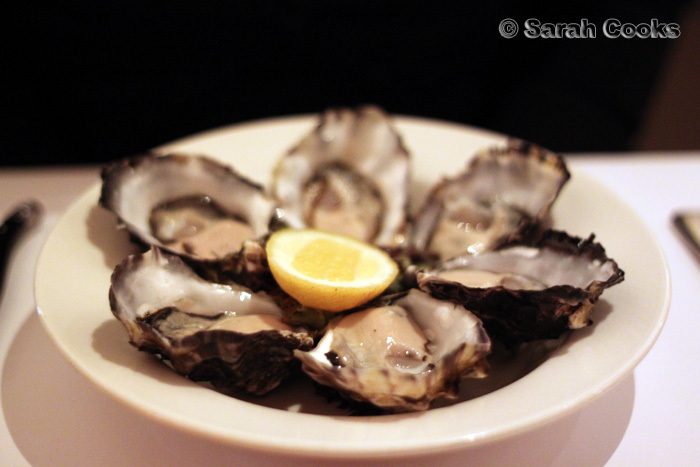 For starters, I had half a dozen Pacific oysters from Moulting Bay in St. Helens. Just natural, thank-you! The best way to eat oysters, in my opinion. These were amazing! Brilliantly fresh and sweet. I could have easily eaten dozen(s) of these, but there was still more to come. I do love oysters, but don't often order them in restaurants - if they're not absolutely perfect they're such a disappointment, and there's always that moment of trepidation before you eat the first one. No such problems here though; they were fabulous. 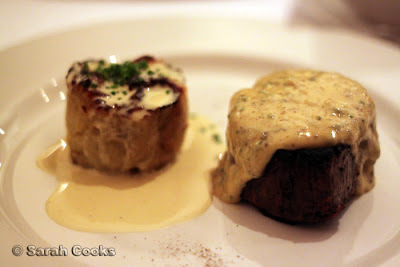 The mains comprise a range of different steaks, with one fish dish and one chicken dish. According to the menu, vegetarian options are available too,but you'll have to check with your waiter as they're not listed. 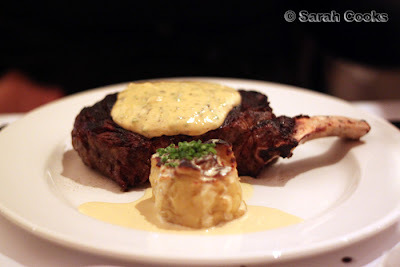 We both ordered steaks - all come with baked Dijon mustard potatoes, and complimentary mustard. We were both a bit extravagant and got truffled béarnaise. I was much more ambitious, and ordered a 400g rib-eye. Meat on the bone = win. 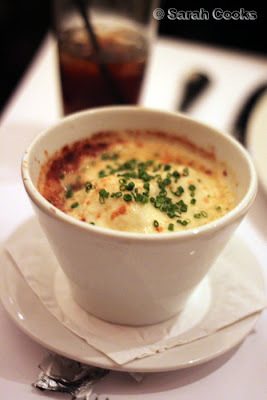 We also got a cauliflower gratin - such a classic accompaniment for a steak! I've never made cauliflower cheese myself, but after this I really think I ought to. The sprinkle of chives on top added another dimension of flavour, and stopped it from being too rich. As you can imagine, after all of that food there was no room for dessert. In fact, I'm ashamed to admit I couldn't even finish my steak, delicious though it was! The desserts cover the classics - sticky date pudding, banana and toffee tart, crème brûlée and so on. Next time I'll have to pace myself a bit more or choose a more modest steak so that I can try the desserts. At about $120 for 2 people, I thought the meal was quite good value (noting that we didn't have any alcohol), and the service was both efficient and friendly. Black Cow Bistro was a lovely spot for a nice, relaxed dinner, and a great introduction to Launceston. Everything looks SO damn good. I can't believe you let 400 measley grams defeat you! :p Come on, Sarah! Porktoberfest crew is disappointed!